On Thursday, the Trump administration made official its deal to save Chinese phone manufacturer ZTE—a company that was almost dead and buried thanks to crushing sanctions put in place by the president’s own Commerce Department. In response, a bipartisan group of senators announced a plan to reverse the agreement. Under the terms of the deal announced by Commerce Secretary Wilbur Ross, ZTE will be required to pay a $1 billion fine and set aside $400 million in escrow for any future violations. The company will also be required to embed a compliance team chosen by the US government into the company, and will have to make changes to its board of directors and executive team within 30 days. “We are literally embedding a compliance department of our choosing into the company to monitor it going forward. They will pay for those people, but the people will report to the new chairman,” Ross said in an interview with CNBC. He also noted the US government will “still retain the power to shut them down again” if necessary. The agreement between the Trump administration and ZTE came after it was revealed that the major phone manufacturer was preparing to cease business operations following a crackdown imposed just one month earlier by Trump’s Commerce Department. The administration issued a seven-year ban that would have prevented ZTE from purchasing parts from American companies. Just a couple months before that, US intelligence agencies warned that Chinese smartphone makers including Huawei and ZTE could be using their technology to spy on people on behalf of the Chinese government. Trump’s decision to make a deal directly with ZTE—reportedly following a direct plea from Chinese leader Xi Jinping, and his daughter receiving seven new trademarks in the country—undermines basically every other lever of the federal government, including members of Congress. In response, a group of senators are aiming to reverse the deal through a piece of legislation introduced Thursday. 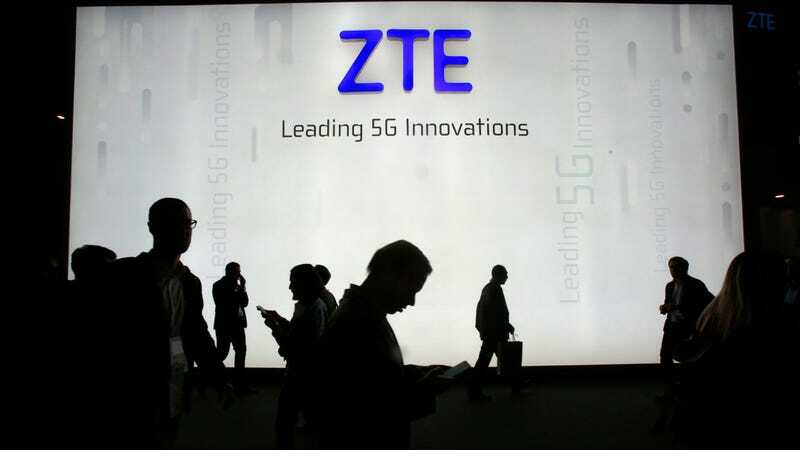 Democratic Senator Chris Van Hollen and Republican Tom Cotton introduced an amendment tied to the must-pass National Defense Authorization Act that would restore the Commerce Department’s initial penalties on ZTE and undermine the White House’s dealings with the company. The amendment would also prevent government agencies from buying telecommunications equipment from Huawei and ZTE, and would ban the government from giving loans or subsidies to either firm. The amendment managed to land a bipartisan group of co-sponsors that includes Senators Chuck Schumer, Marco Rubio, Richard Blumenthal, Susan Collins, and Bill Nelson. “Both parties in Congress must come together to bring the hammer down on these companies rather than offer them a second chance, and this new bipartisan amendment will do just that,” Schumer said, per The Hill. Unfortunately for the group of lawmakers, there aren’t a whole lot of options at this point to stop Trump’s attempt to save Chinese jobs. Yesterday, Reuters reported the restrictions lawmakers can pursue are limited compared to the president’s broad powers, which would allow him to waive any sanctions placed on ZTE. Add to that the fact any real effort to undermine the deal—such as crafting legislation designed to bar Trump from spending any money to ease sanctions on ZTE—would put Republicans who vote for it in the uncomfortable position of a direct showdown with Trump, it seems unlikely that any truly confrontational law is unlikely to garner enough support. Pending some spontaneous spine growth from the Republican side of the aisle, it looks like Trump has made good on his promise to make deals to save jobs. Who knew he was talking about jobs in China the whole time?